Line a 29cm square tin with parchment paper. Melt the chocolate in a dish over hot water until smooth. Put the biscuits, nuts OR krispies & most of the marshmallows into a large bowl and pour the melted chocolate over stirring well to coat everything. Tip the mixture into the prepared tin, spreading out to fill the corners and pressing down. Scatter the remaining marshmallows and the dried strawberries OR the ruby berries & cherries on top & press down gently with the back of a spoon. Put in the fridge for at least 3 hours then cut into squares to serve. This lovely sweet raspberry mousse is light and full of a tangy berry flavour. Made with fresh raspberries, this tasty mousse serves 6-8 people and is perfect for parties. It takes 15 mins to make and a little time to set – and is well worth the wait. Top with fresh whipping cream and handfuls of berries for an even naughtier treat. Dissolve the jelly in 300ml boiling water. 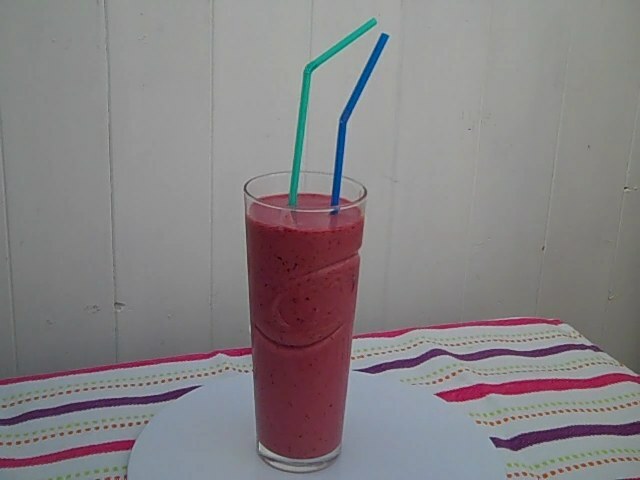 Pour the hot mixture over the raspberries and whizz in a blender until well mixed and the fruit is squashed. Tip into a sieve and push the mixture through to get rid of the pips. Stir in the sugar. Whisk the evaporated milk in another bowl to a thick foam and then mix well into the setting raspberry jelly. Pour the raspberry mousse into a serving bowl and leave to set. Top with more raspberries for serving. Combine all of the ingredients in a blender and purée until smooth. Depending on the type of blender you have, you may need to stop and stir occasionally to help it along. If the mixture is too thick, add 2 tablespoons more pomegranate juice and blend again. Pour into glass and serve cold. This amount of ingredients made just under 400mls of smoothie.